By Bogna Haponiuk and Wojciech Sas - PhD candidate. What is the dot product formula? Triple product - how to calculate the volume of a parallelepiped? The vector dot product calculator comes in handy when you are solving vector multiplication problems. Instead of calculating the scalar product by hand, you can simply input the components of two vectors into this tool and let it do the math for you. 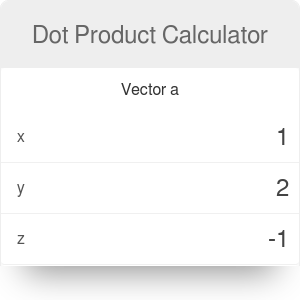 Keep reading to learn what dot product formula our calculator uses, how to estimate the dot product of two vectors, and how to generalize the formula for matrix dot product. Together with the cross product calculator, they'll show you that vector algebra isn't the thing to worry about! There are two main types of vector multiplication: the dot product (also called the scalar product), denoted with the symbol "·", and the cross product, denoted with the symbol "×". The main difference is that the product of the dot operation is a single number, while the outcome of the cross operation is a vector. If you are not sure what is the magnitude of a vector or how to calculate it, head to the unit vector calculator for more details on the subject. You can probably notice that if the angle between two vectors is equal to 90°, then the scalar product will always be equal to 0, regardless of the vectors' magnitudes. Similarly, if the angle is equal to 0° (the vectors are collinear), then the dot product is found by multiplying the multitudes only. In other words, the bigger the relative slope between two vectors, the higher the value of dot product. In a space that has more than three dimensions, you simply need to add more terms to the summation. If, on the other hand, you want to multiply vectors in a 2D space, you have to omit the third term of the formula. cosα = a·b / (|a| * |b|). So, how does our vector multiplication calculator work? Follow this step-by-step example to get a better understanding of the principle behind this process. Choose your vector a. For example, we will take a = [4, 5, -3]. Choose your vector b. Let's assume it is equal to b = [1, -2, -2]. Calculate the product of the first components of each vector. In this case, it is equal to 4 * 1 = 4. Calculate the product of the second (middle) components of each vector. In this case, it is equal to 5 * (-2) = -10. Calculate the product of the third components of each vector. In this case, it is equal to (-3) * (-2) = 6. Add all of these results together to find the dot product of the vectors a and b. The result is 0. 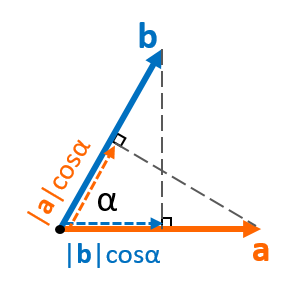 This is the scalar product of these two vectors. It means that they are perpendicular to each other (the angle between them is equal to 90°). It is also possible to calculate a scalar product of two vectors if they are written in spherical coordinates. To deal with the challenge, we need to express our new coordinates with the radius r and two angles θ, φ.
a·b = x₁*x₂ + y₁*y₂ + z₁*z₂ = r₁*r₂ * sinφ₁*cosθ₁ * sinφ₂*cosθ₂ + r₁*r₂ * sinφ₁*sinθ₁ * sinφ₂*sinθ₂ + r₁*r₂ * cosφ₁*cosφ₂. a·b = r₁*r₂ * (sinφ₁*sinφ₂ * cos(θ₁-θ₂) + cosφ₁*cosφ₂). cij= ai1b1j+ ai2b2j+ … + ainbnj= Σkaikbkj. It's analogous to the scalar product of simple vectors, but the procedure has to be repeated several times for each element. However, not every two matrices can be multiplied. If we consider A as m x n and B as k x l matrices, then for the resulting matrix C = A·B n has to be equal to k, and for matrix D = B·A l must be the same as m. In other words, the number of columns of the left matrix has to match the number of rows in the second one. As you may have already noticed, products A·B and B·A are different in general, which means that the scalar product of two matrices is noncommutative. In particular, dimensions of resulting matrices aren't the same. Let's take a look at the dot product formula in detail. If we draw both vectors separated by the angle and try to find the image of the scalar product, we will realize that this consists of the multiplication of two parts: the projection of one vector to the direction of the second one and that second vector. Since they are both parallel, the result is just the product of their lengths. As shown in the picture, the operation can be performed in two ways, but the result is always the same. As a conclusion of this section, we can say that the dot product is a multiplication of vectors' lengths, projected in the direction of one of them. A particular case is the dot product of a vector with itself, a² = a·a. 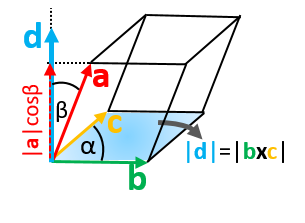 Since the projection and the vector is the same thing, the outcome is the square of the vector's length. In other words, we can find the length of any vector using the square root over the following dot product: |a| = √(a·a). V = a · (b × c). Construct a parallelepiped in the Cartesian coordinate system. Denote its sides as a, b, c - we can interpret them as vectors attached in one point. The value of b × c = |b||c|sinα resembles the formula for the area of a parallelogram. As a result, we get the vector which length is equivalent to the area of the base, and it's perpendicular to it. The last step is to calculate the dot product of a·d. As we know from the previous section, it's the projection of a to the direction of d multiplied by d. If we take a closer look, we can realize that this projection is actually the height of our polyhedron and the resulting product is nothing else than its volume! The crucial thing is that the order a-b-c-a-b-c-... has to be conserved. Otherwise, the result will be negative. We can always circumvent the problem working out the volume as an absolute value of the triple product. When both α and β are equal 90°, then the outcome is nothing else but the volume of rectangular prism! There are several areas where scalar product turns out to be handy. The law of cosines can be proved with the usage of dot product: If we create a triangle out of 3 vectors, we can write that e.q. c = b - a. If we want to find c², we can expand the formula as: c² = (b-a)·(b-a) = b·b – b·a – a·b + a·a = a² + b² - |b| * |a| * cosa - |a| * |b| * cosa = a² + b² – 2 * |a| * |b| * cosα. The last step is obviously possible because the multiplication of lengths is commutative. And that's it - another way to prove the cosine law! As it was mentioned at the beginning - the scalar product is the simplest way to find if two vectors are perpendicular to each other. Magnetic potential energy as a scalar product of magnetic moment and magnetic field. Bogna Haponiuk and Wojciech Sas - PhD candidate. Dot Product Calculator can be embedded on your website to enrich the content you wrote and make it easier for your visitors to understand your message.